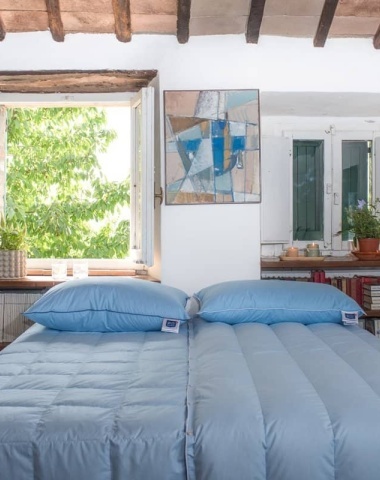 Made-to-Measure: create your personal bedding collection by Piumini Danesi. 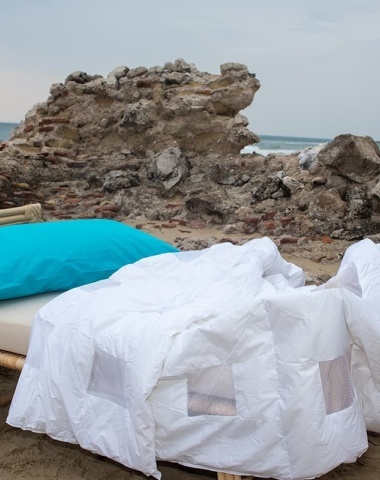 This duvet was created to address recent climate changes. Alet means noble and Alet will give your bedroom a noble touch. Generally the Chiropratic pillow makes people sleep much better, because they move and toss less during sleep. DON'T WASTE THIS UNIQUE OPPORTUNITY! A range of products from last years' collections at a very convenient price. Hurry up as only a limited supply is available. 100% cotton sateen plain color with sateen application. Jacquard fabric 60% cotton and 40% linen. 100% cotton Percalle plain color Made in Italy with plumetis application. 100% cotton sateen plain color with sateen application and embroidery. Bed linens, pillows, duvets and duvet-covers in any shape and size can be custom-made by our skilled craftmen. Orange in contrast with blue, bright and spring colors, suitable for those who never give up the joy of colors, for those who like to start the day with the right energy. 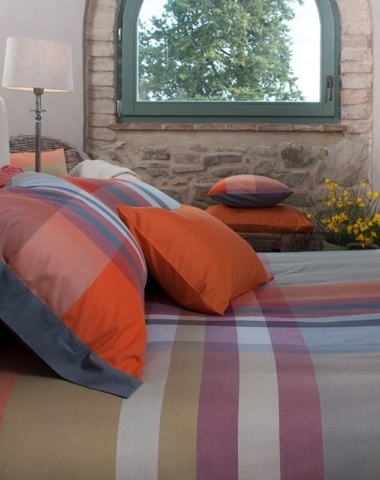 The ONDA duvet cover is suitable for you with geometric and youthful lines. Spring-inspired floral pattern a tribute to the beauty of nature that awakens after the cold winter. This soft and smooth duvet cover combines the warm shades of the earth and a classy winding design. The innovative climate zones make air circulate and ensure a feeling of well-being, as temperature and climate in the bed remain better balanced and constant. Created for those who love to wrap themselves in fine luxurious items and experience the ultimate in softness and comfort. Currently, must be ordered. 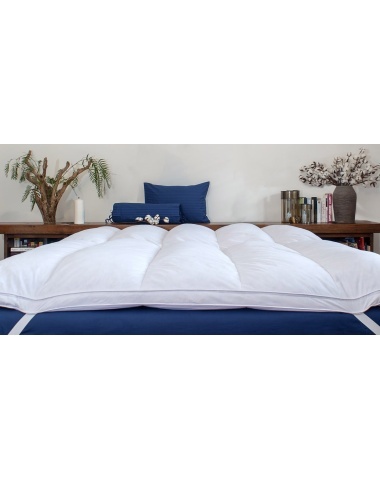 For summer nights the Lightest duvet is a breath of freshness. The filling’s incomparable lightness allows maximum transpiration while absorbing the night-time humidity. Our original duvet has been in production for more than 40 years. 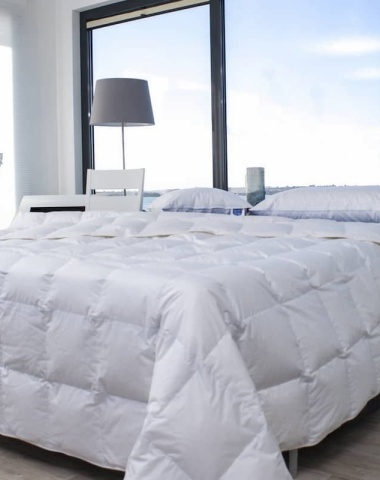 Of an indiscernible lightness, this duvet is made of the softest high-quality goose down encased in the finest white Swiss batiste cotton fabric. Our “intermediate” duvet has neither a high nor low fill content but just the right amount to help you secure a healthy sleep. The D'OC Deluxe pillow represents the maximum of luxurious softness. A blissfully soft cushion between you and your rigid mattress. Inspired to the elegance of the historic Tartans, the Stone duvet cover brings the atmosphere of the Highlands to your bed. 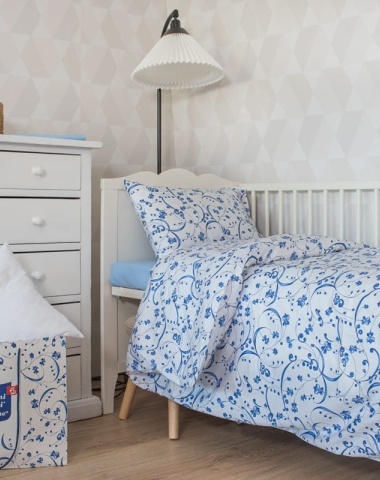 The blue shades of the sky and the simple yet elegant design make this a dream duvet cover. “Nido di coccole” means in Italian “the soft nest of hugs” and what more can you ask for, when you for instance need to run an errand and instead of disturbing the little one by dressing him, you just put baby into the “hug bag” ;-) and off you go. Over the years, many have claimed the Garden of Eden has been found. Of course the location of each "discovery" is in a different location. But your own Eden will be your bed with many flowers straight from paradise. When a sweater is too warm and a T-shirt too light you will wrap yourself in Muffle to keep your shoulders and neck warm, while enjoying your well merited leisure time or finishing your chores at home. Thais, a devotee of Venus gave her name to this exquisite duvet cover. White, refined, luminous bedspread in pure 100% cotton with thousand stribes made by weaving yarns of different thickness. 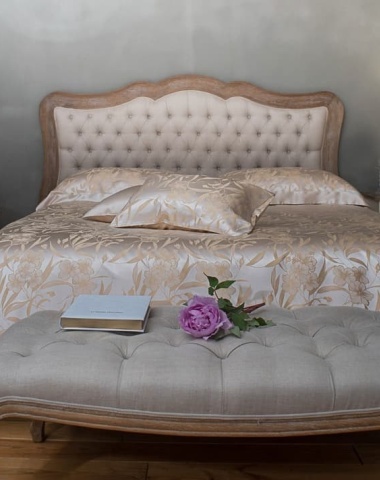 Our “Silk” duvet is made of pure goose down and a luxurious ivory jacquard silk lining. U-shaped tubular pillow diameter cm 25 with 2 arms 70cm. It can softly embrace you while sleeping, reading or looking at TV, making you feel wrapped up in pleasant hug. Choose fabrics and colors to compose your unique and personal bedding set. Piumini Danesi pooq dene offers with Natur Duo, bedding made ad hoc for our busy times, with matching sheets set and duvet covers in practical seersucker cotton. 100% cotton Percalle plain color Made in Italy. Our factory is a member of EDFA, that for years has opposed to "Live Pluck", and Danish factory has frequent IDFL (International Down and Feather Laboratory) audits carried out on all the European suppliers. Piumini Danesi pooq dene works closely with Danish farmers who ensure geese are raised in open air farms. The duvet cover for those who love to dare, Savanna will take you directly to the wild and distant lands. Give yourself a pinch of adventure with boldness and courage.